High Meadow Ranch is located on FM 1774 one mile north of State Highway 149 between Tomball and Magnolia, 30 miles northwest of downtown Houston. Traveling north (from the Houston area) take Hwy. 249 seven and a half miles north of the intersection of 249 & 2920. (Note that 249 turns into 1774 as it narrows into a two-lane road about 1 mile before you reach High Meadow Ranch. )You’ll see the large "Texas Size" sign at the entrance to High Meadow Ranch on the left. Proceed into the subdivision, turn right at the first cross street, follow for about two miles to the large entry sign for the golf course where you’ll turn right. Proceed 1/4 mile to the entrance that will be on the left. Traveling west (from I45 or The Woodlands) take Hwy. 1488 west to Hwy. 149 south (left). Follow 149 south to the intersection of 1774 where you’ll turn right. Proceed 1 mile where you’ll see the large "Texas Size" sign at the entrance to High Meadow Ranch on the left. Proceed into the subdivision, turn right at the first cross street, follow for about two miles to the large entry sign for the golf course where you’ll turn right. Proceed 1/4 mile to the entrance that will be on the left. Traveling from between Houston and The Woodlands it’s best to take Hwy. 2920 west to Hwy 249 north (right). Then take Hwy. 249 seven and a half miles north of the intersection of 249 & 2920. (Note that 249 turns into 1774 as it narrows into a two-lane road about 1 mile before you reach High Meadow Ranch.) You’ll see the large "Texas Size" sign at the entrance to High Meadow Ranch on the left. Proceed into the subdivision, turn right at the first cross street, follow for about two miles to the large entry sign to the golf course where you’ll turn right. Proceed 1/4 mile to the entrance that will be on the left. 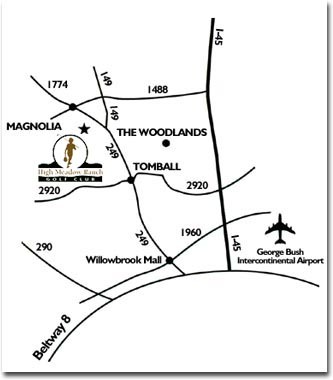 Traveling from George Bush Intercontinental Airport take Beltway 8 west and exit on Hwy. 249 north. Follow Hwy. 249 approx. 22 miles north to the entrance to High Meadow Ranch. (Note that 249 turns into 1774 as it narrows into a two-lane road about 1 mile before you reach High Meadow Ranch.) You’ll see the large "Texas Size" sign at the entrance to High Meadow Ranch on the left. Proceed into the subdivision, turn right at the first cross street, follow for about two miles to the large entry sign to the golf course where you’ll turn right. Proceed 1/4 mile to the entrance that will be on the left. Write down the phone number 281-356-7700 and call us if you need any help.